At this time of year, I’ve been given a special Christmas present: what I think we should call the Publican’s ’Postrophe. Until today, all I had was hearsay – but now, as Othello says, we have ‘ocular proof’ from the window of the very hostelry in London’s Wood Green where these ‘Christma’s Partie’s’ are advertised. There is of course some clever word play here, despite the artless lettering. 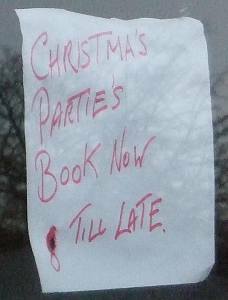 For surely these are no ordinary Christmas parties but festivities in honour of Mary, Christ’s Ma?